This rustic, easy-to-make, hundred- year-old Corned Beef with Kale recipe is perfect for St.Patrick Day, and would hit the spot on any brisk March day. The recipe called for whole kale leaves, and suggests a presentation that features them. I used Lacinato Kale (also known as Dinosaur Kale). It retained its shape when cooked, and its sweet nuttiness worked well with the flavorful corned beef. Put corned beef in a large pot and cover with water. Add spice packet that came with it. Cover and bring to a boil using high heat; reduce heat and simmer 50 minutes per pound or until tender. Remove from water and let rest for 10 minutes; then thinly slice. About 45 minutes before the corned beef will be ready to serve, wash and trim kale to remove the bottom portion of the stem and leaves. Gently tie into bunches using cooking twine. Put into a large pot and cover with water. Bring to a boil using high heat. then reduce heat and simmer for 30 minutes. Remove from water. Untie and, if desired, drizzle with melted butter. 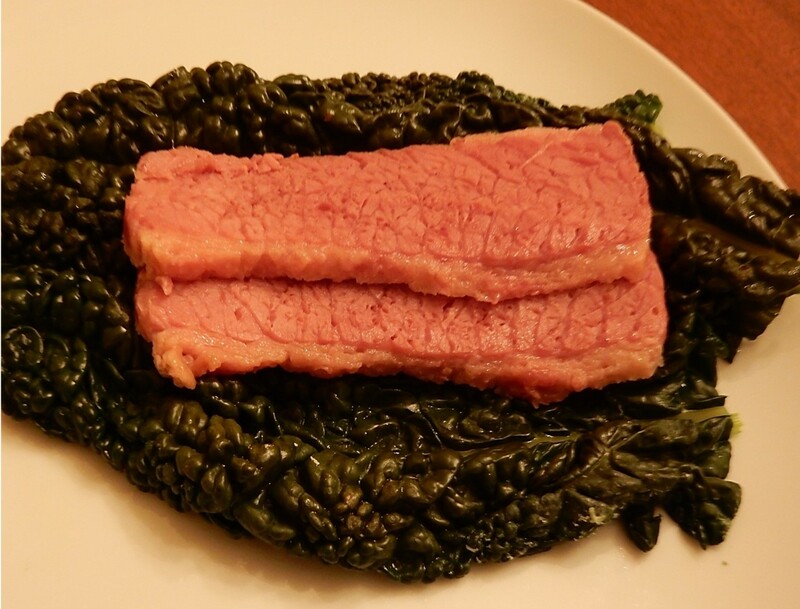 To serve: Put kale leaves on plate, and top with the sliced corned beef.